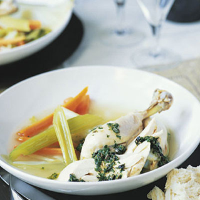 This is a really soothing winter dish; the light flavours of the poached chicken, broth and vegetables work well with the robust salsa verde - there's more than enough for six hungry people. It's delicious with chunks of warm crusty bread. Place the chickens in a large saucepan or casserole dish and cover with water. Add a pinch of salt and bring to the boil. Simmer for 30 minutes then add the prepared vegetables and simmer for 30 minutes more until the chickens are cooked thoroughly and there is no pink meat. For the salsa verde, place the parsley and mint on a chopping board with the puttanesca mix and chop to make a coarse paste. Transfer to a bowl and stir through the mustard, lemon juice and two tablespoons of olive oil from the puttanesca mix. Remove the chickens and vegetables from the stock and place in a large serving dish. Return the stock to the heat and simmer rapidly for 10-15 minutes. When the chickens have cooled enough to handle, remove the skin and cut into pieces. Share the chicken pieces and vegetables between large shallow serving bowls and ladle some stock over the top. Serve with a dollop of salsa verde and warm Waitrose Italian Style Pane Rustico or Waitrose Traditional Wholemeal Bread. If you have any salsa verde left over, serve it the next day stirred through pasta topped with grated Parmigiano Reggiano.